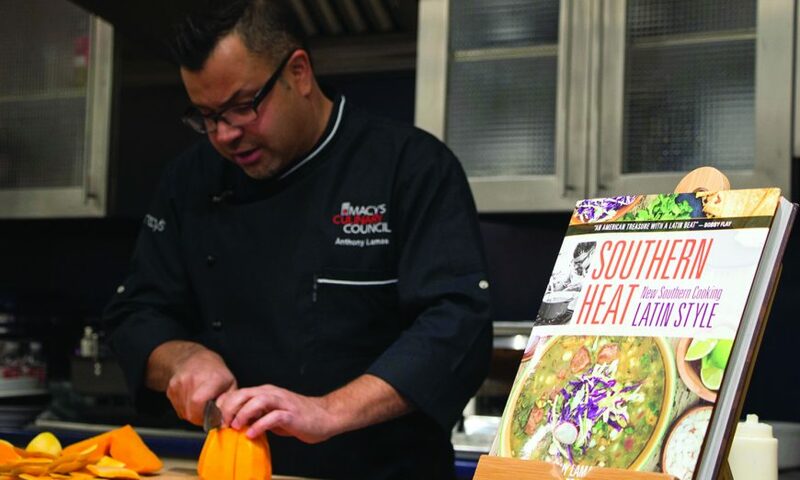 The progressions from growing up working on a farm to becoming a chef wasn’t traditional for Anthony Lamas, but a love of food and a few of his mother’s recipes took him from his humble Central Valley beginnings to owning an award-winning and successful Louisville restaurant, multiple television appearances and a seat on Macy’s Culinary Council. Having lived in Kentucky for the past 20 years, Lamas has put the South on the map when it comes to Nuevo Latino cuisine by taking a traditionally Southern dish like a Kentucky Hot Brown and spicing it up with a Manchego-jalapeno Morany sauce or a sweet treat like Georgia pecan brittle and turning up the heat with the additional of smoked Serrano powder. One of the main things Lamas stressed throughout the two-hour demonstration pertained to the importance of layering flavors in cooking, starting with a chef’s stock and building from there before adding a touch of acid and a hint of heat to everything from traditional chicken noodle soup to his pumpkin bisque with fresh goat cheese. Although Lamas promotes the use of citrus, he is quick to caution blossoming chefs on using citrus seeds or dropping entire lemons in dishes, as the seeds and rind have the ability to turn an entire dish bitter. Instead, Lamas encouraged home cooks to squeeze in lemon juice or utilize a microplane and adding the zest to provide the tang that takes dishes up a notch. Other tips Lamas provided were for chefs to make their roux in larger batches and freeze it in single serving bags to save time when cooking, and to experiment with both dried and fresh chilies as they each provide separate, distinct flavors to finished dishes. 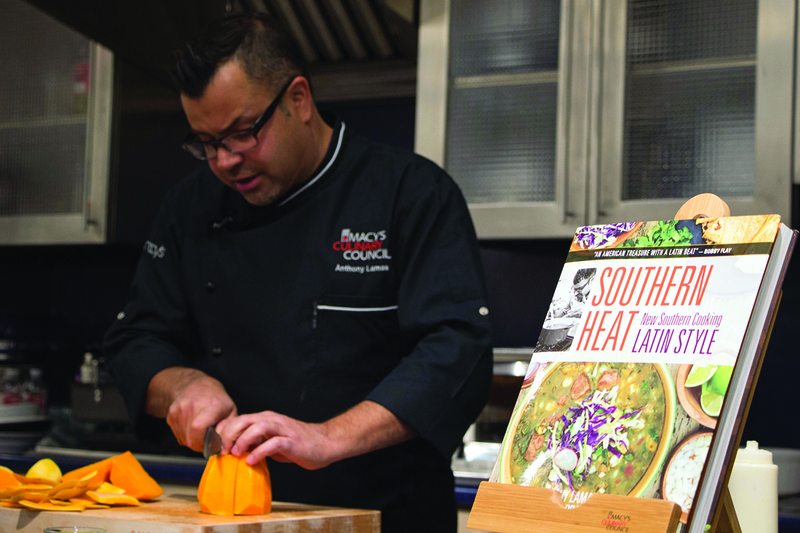 And, when it came to being adventurous in the kitchen, Lamas emboldened the audience to take a chance and try new techniques and recipes at home. “That’s what’s fun about cooking,” he said. “You can be creative and everybody can kind of do their own spin on things. Never be afraid of failure because you can always make it over and try again. What you want to do is when you’re cooking with chicken or you’re cooking with seafood be afraid of overcooking, don’t be afraid of undercooking … Once you’ve overcooked it, it’s ruined. Take it out a little earlier to check your chicken. Plus, when you let it rest it’s going to cook through. Lamas will appear on an episode of FYI’s Scraps, a culinary series that shows how chefs can create incredible feats in unexpected places using food waste and scraps, in early December.